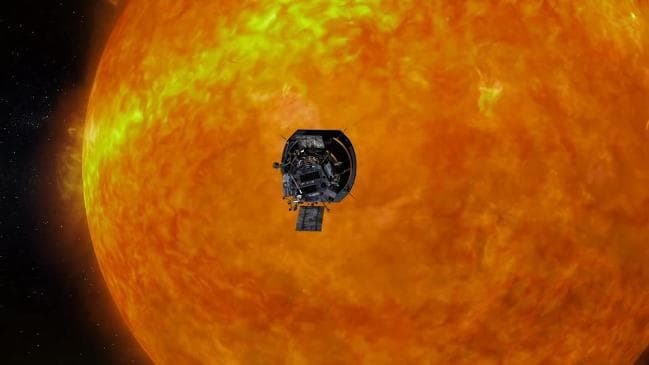 On August 11, NASA will launch a super-fast space probe that will travel through the sun’s atmosphere. Thanks to sophisticated instruments and state-of-the-art thermal shielding, the spacecraft will be able to go where no other human-made machinery has gone before. Its mission is to answer some of the most pressing mysteries about the sun and stars in general. The Parker Solar Probe will launch tomorrow, with a launch window starting at 3:33 a.m. EDT, aboard a United Launch Alliance Delta IV Heavy rocket that will light the sky above Cape Canaveral, Florida. The light-weight probe — no bigger than a compact vehicle — should become the fastest human spacecraft ever, a record currently held by the New Horizons probe launched in 2006. NASA estimates that the probe will reach a top speed of 692,000 kilometers per hour (430,000 miles per hour). UPDATE: The US space agency was forced to delay its launch from Cape Canaveral, Florida, on Saturday following last-minute investigations. It eventually lifted off at 3.31 am eastern time (8.31 am BST) on Sunday morning. This breakneck speed won’t last long though, as NASA plans to slow Parker down so it can safely enter the sun’s orbit. Engineers plan to lower the probe’s velocity by making a gravity slingshot around Venus, which Parker will circle seven times, with each pass bringing it closer to the surface of the sun. Gravity slingshots are typically used to accelerate spacecraft by catching orbital momentum from the planet. However, the reverse process (approaching the planet in the opposite direction that it’s orbiting the Sun) will be used to slow down the craft. During its closest approach to the sun, Parker will stand just 3.8 million miles away from the sun’s surface, where it will be exposed to temperatures of millions of degrees Celsius and 475-times the solar power an Earth-orbiting satellite experiences. “We’ve been studying the Sun for decades, and now we’re finally going to go where the action is,” said Alex Young, associate director for science in the Heliophysics Science Division at NASA’s Goddard Space Flight Center in Greenbelt, Maryland. Credit: NASA/Johns Hopkins APL/Steve Gribben. There’s a lot of things we don’t know about the hot ball of glowing plasma at the heart of our solar system. For one, the sun is dynamic, constantly belching magnetized material outward even as far as beyond Pluto’s orbit. The intensity and frequency of these ejections wax and wane according to a nearly periodical 11-year solar cycle. For instance, at the peak of the cycle, our star grows more sunspots and spews more solar flares, which can damage satellites in Earth’s orbit and even our electrical grids. The influence of solar activity on Earth and other worlds is known as space weather. Now, scientists are looking to understand the sun and its weather activity by sending a probe to its surface, just like weather satellites in orbit that track Earth. This mission has been in the making for the last 60 years, ever since physicist Eugene Parker published a groundbreaking scientific paper in 1958 theorizing the existence of the solar wind. For its mission, Parker carries a range of instruments that can study the sun both remotely and in situ (directly) — the kind of observations that might unravel some of the sun’s most well-kept secrets. Of course, NASA has several specific questions it wants Parker to investigate. One of them has to do with the mystery of the acceleration of solar wind — the constant ejection of magnetized material from the sun. Somewhere, somehow, this solar wind is accelerated to supersonic speeds. Parker will fly straight through the corona — the sun’s atmosphere that extends millions of kilometers into outer space. The corona is scorching hot, reaching temperatures in the range of millions of degrees Celsius. However, the sun’s surface has a temperature of only about 6,000 degrees Celsius. This makes no sense at first glance: how is it possible that the surface of the sun is so cold compared to its atmosphere? Well, scientists hope that Parker might come up with an answer to this counter-intuitive conundrum. To answer these questions and more, Parker will rely on instruments such as the FIELDS suite which will capture the scale and shape of electric and magnetic fields in the Sun’s atmosphere. Of course, there will also be an imaging instrument — because how could a probe fly this close to the sun and not take awesome pictures? Called WISPR, short for Wide-Field Imager for Parker Solar Probe, the instrument is mainly designed to image coronal mass ejections (CMEs), jets and other solar ejecta. The SWEAP suite of instruments, short for Solar Wind Electrons Alphas and Protons Investigation, will count the most abundant particles in the solar wind — electrons, protons, and helium ions — and measure such properties as velocity, density, and temperature to improve our understanding of the solar wind and coronal plasma. Finally, ISʘIS suite – short for Integrated Science Investigation of the Sun, and including ‘ʘ’, the symbol for the Sun, in its acronym – measures particles across a wide range of energies in order to understand their life cycles — that is, where they came from, how they became accelerated, and how they move out from the Sun through interplanetary space. 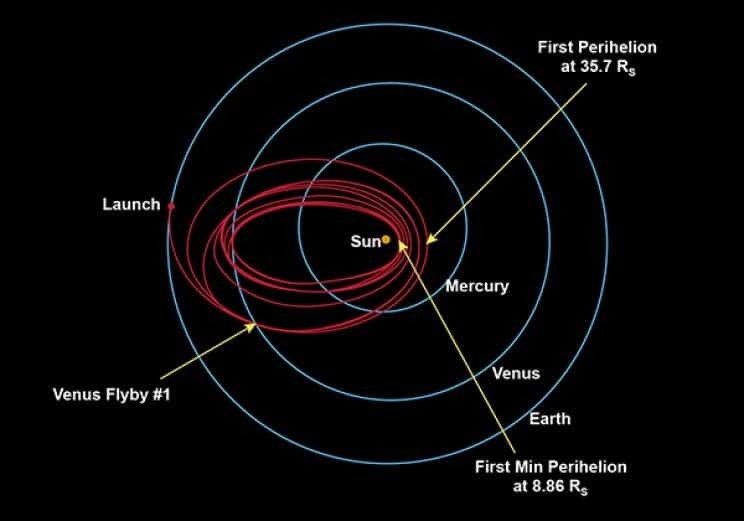 At its nearest perihelion (closest orbit point to the sun), the probe will come seven times closer than any spacecraft before. Credit: NASA. But how will Parker keep its ‘wings’ from melting? During its closest flyby, Parker will be only 6.1 million kilometers (3.8 million miles) from the sun’s surface, where temperatures can reach millions of degrees Celsius. But there’s a catch — just because the corona is that hot, it doesn’t mean that the probe will ‘feel’ that temperature due to the phenomenon of heat transfer. Simply put, some mediums conduct heat (energy) better than others. For instance, if you stand on a tile floor you’ll feel cold but if you stand on a carpet your feet feel comfortably warm. However, both kinds of surfaces have the same temperature because they’ve had time to reach a thermal equilibrium — it’s just that the tile floor is a good heat conductor, which will make your feet seem cold as heat passes from your feet into the tile. The carpet is a poor heat conductor and it would take ages for your feet to match its lower temperature. Bearing this in mind, we can now understand how Parker won’t get obliterated — even though the corona has a very high temperature, the sun’s outer atmosphere has a very low density and, hence, is a poor heat conductor. According to NASA, Parker’s sun-facing side will be heated to only about 1,644 degrees Kelvin (1,370 C° or 2,500 F°). That’s still a lot, to be fair, which is why the Parker Solar Probe is equipped with a cutting-edge heat shield called the thermal protection system, or TPS. It’s a sandwich of carbon-carbon composite surrounding nearly 4.5 inches of carbon foam, which is about 97% air. Thanks to its lightweight materials, the TPS only weighs 72.5 kilograms (160 pounds) despite being nearly 2.4 meters (8 feet) in diameter. Anything behind the shield shouldn’t heat to more than 300 Kelvin (30 C° or 85 F°)! A cooling system that runs on pressurized deionized water will keep temperatures at manageable levels in the parts fully exposed to the sun. The key is for the shield to be always facing the sun, but sometimes the probe will have to operate for long periods of time without being able to communicate with Earth. 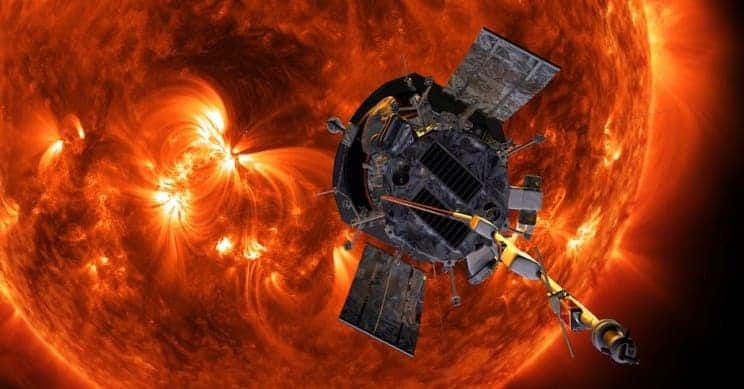 To solve this predicament, NASA engineers have designed a fault management system that self-corrects the probe’s course and direction facing the sun to ensure that the scientific instruments stay cool and functioning. If for some reason Parker doesn’t launch by 23 August, it will have to wait until May 2019 for the next launch opportunity, when Earth and Venus will again be lined up correctly. Let’s keep our fingers crossed for a safe journey to the sun!